The Best Software Testing blogs from thousands of top Software Testing blogs in our index using search and social metrics. Data will be refreshed once a week.Also check out Software Testing Podcasts and Software Testing Youtube Channels list for Top videos on Software Testing. 2.49 Kualitee - Discussing New Bugs In Software Or Apps. Software Testing newsletter is a comprehensive summary of the day's most important blog posts and news articles from the best Software Testing websites on the web, and delivered to your email inbox each morning. To subscribe, simply provide us with your email address. The Stack Exchange network About Blog Software Quality Assurance & Testing Stack Exchange is a question and answer blog for software quality control experts, automation engineers, and software testers. Facebook fans 63,634. Twitter followers 260. United Kingdom About Blog TestingExcellence.com 's mission is to bring you useful daily information related to Software Testing and Quality Assurance published around the web. Facebook fans 5,390. Twitter followers 719. About Blog A place for the discussion of quality assurance, software testing and all the other tools created for testing. Facebook fans 1,207,731. Twitter followers 573,511. Providence, RI About Blog Automation Testing, like all development efforts, is difficult. Most projects don’t succeed. You can do better. Discover automation testing awesomeness. Facebook fans 1,040. Twitter followers 5,312. USA About Blog Free Software Testing Magazine talks news & tools for unit, TDD, integration, functional, acceptance, load, performance, agile testing in software development. Facebook fans 2,357. Twitter followers 8,088. Hyderabad About Blog This Youtube channel shares Software Testing Step by Step Tutorials, Manual Testing Tutorials, Selenium Tutorials, UFT / QTP Tutorials, SQL Tutorials. Facebook fans 5,304. Twitter followers 141. About Blog Software Testing Material is a blog dedicated to all the professional Software Testers. At Software Testing Material, main goal is to provide cutting-edge helpful articles, best practices, and other information about the software testing that are easy to understand for testing professionals and non-technical people who want to choose a career in Software Testing. Facebook fans 1,483. Twitter followers 14. Orange Park, FL About Blog Software testing and software QA online community with content, conversation, and practical advice on software test automation, test management, test techniques, agile testing & more. Facebook fans 1,524. Twitter followers 5,454. About Blog Comprehensive up-to-date coverage for software testing and quality assurance, aggregated from news sources all over the world by Google News. Facebook fans 21,972,623. Twitter followers 212,833. Palo Alto, CA About Blog BlazeMeter platform for load and performance testing enables dev and QA teams to run scalable and continuous testing for website, mobile, api and software. Facebook fans 8,689. Twitter followers 3,341. About Blog Official place for Google Testing news and updates. Facebook fans n/a. Twitter followers 25,198. About Blog Browser Testing made simple! Run automated, visual, and manual tests on 1500 real browsers and mobile devices. Facebook fans 1,926. Twitter followers 1,626. Vienna. Silicon Valley. About Blog Accelerate software testing to keep pace with Agile and DevOps - with the industry's most innovative software testing tools for Continuous Testing. Download a trial today! Facebook fans 3,413. Twitter followers 13,200. Munich, Germany About Blog Testbirds specialises in the testing of software such as apps, websites and Internet of Things applications by using innovative technologies and solutions. Facebook fans 3,007. Twitter followers 1,016. Mountain View, CA About Blog Load Testing and Performance Monitoring blog with tips & best practices on load testing, mobile testing, performance monitoring and real user monitoring. Facebook fans 737. Twitter followers 7,804. Newton, MA About Blog TechTarget’s software development resource, covering all aspects of the development lifecycle, including models, requirements, testing and QA and more. Facebook fans 2,776. Twitter followers 2,408. About Blog Ranorex is a software development company that provides innovative test automation software to thousands of companies in over 60 countries. It provides automated testing of desktop, web and mobile software with Ranorex test automation framework. Facebook fans 876. Twitter followers 2,185. Laguna Hills, CA About Blog The Official Centercode Blog, covering Beta Testing and Beta Test Management. Centercode is the leader in Beta Test Management Platforms and Services, offering everything you need to run effective beta programs. Facebook fans 607. Twitter followers 1,952. About Blog A blog about manual software testing and automated testing tools tutorials like selenium IDE tutorial, Apache Jmeter tutorial, webdriver tutorial etc. Follow this blog to learn selenium webdriver, appium, selenium IDE and jmeter from beginners to advanced level. Facebook fans 2,528. Twitter followers 329. Plymouth, MN About Blog IIST is an educational and professional development organization that has been founded to advance the software test and quality assurance profession by promoting and recognizing professionalism through education. Facebook fans 2,675. Twitter followers 154. Worldwide Cloud Service About Blog Bitbar Testing blog provides lots of useful best practices, tips, tricks and hands-on example of how to use test automation for mobile app testing. Facebook fans 997. Twitter followers 38,236. Hamburg About Blog Automated GUI Testing and Code Coverage blog with information and tips to Squish GUI Tester and Coco Code Coverage. Facebook fans 147,036. Twitter followers 222. US About Blog PractiTest is an end-to-end QA & Test Platform to manage the teams’ projects, resources and lifecycle. The system includes modules to manage Requirements, Tests and Issues; as well as to show the traceability between them throughout the project lifecycle. Facebook fans 155. Twitter followers 612. Minneapolis, United States About Blog Monitoring solutions for websites, web applications, and Internet network infrastructure A unified SaaS suite of on-demand external Monitoring solutions Multiple, worldwide monitoring agents. Facebook fans 1,448. Twitter followers 2,407. UK About Blog TestLodge software testing blog bringing you the latest news and tutorials for QA and software testing professionals. Facebook fans 2,976. Twitter followers 1,038. Dallas, TX About Blog Blog on Software Testing industry by leading Independent Software Testing Company Cigniti Technologies. Cigniti is the world's first Independent Software Testing Services Company to be appraised at CMMI-SVC Level 5, and an ISO 9001:2008 & ISO 27001:2013 certified organization. Facebook fans 4,882. Twitter followers 2,462. Bengaluru, India About Blog Testing Studio is an attempt to share some incredible knowledge from industry leaders & experts, which should be helpful for anybody to start his/her career in S/W Testing or to progress it further. Apart from the technical nitty-gritties, one can also find some intellectual posts by industry experts sharing their Wisdom. Facebook fans 34,692. Twitter followers 1,954. Boston, MA About Blog The only ML-driven test automation service that automatically maintains tests and identifies regressions for you. mabl uses machine intelligence to give QA teams reliable Continuous Testing in the DevOps world, with adaptive tests and automated testing insights. Facebook fans 58. Twitter followers 392. Lakewood, CO About Blog A1QA software testing firm offers software QA outsourcing, software testing services including web application testing and dedicated QA team creation. Mission to help our clients make distinctive, lasting, and substantial improvements in their business and continue building a great company that attracts, develops, excites, and retains exceptional people. Facebook fans 623. Twitter followers 911. Galway, Ireland About Blog A guide to all that is happening in the TEST Huddle community including upcoming events, a weekly roundup and featured blog posts. Facebook fans 2,050. Twitter followers 1,222. Philadelphia, Dallas and SFO About Blog A blog from Software Testing Specialists. Gallop Solutions is North America’s largest Independent Software Testing company with 2000 QA consultants globally & 600 located in USA. Start with an expert advise. Facebook fans 393. Twitter followers 2,228. McKinney, TX About Blog Here, managers will find out the overall benefits of quality improvement through testing and QA and get software testing and quality assurance peculiarities explained in clear and practical articles. Facebook fans 412. Twitter followers 352. Santa Clara, California About Blog Read the latest blog posts and thought leadership from QMetry executives. QMetry for JIRA is a comprehensive test management solution that helps enterprises launch their digital initiatives to market faster, with less risk. Facebook fans 65. Twitter followers 759. About Blog Everything you need to know about mobile application testing, Experitest, and how we aim to make your UX so stellar, you will easily conquer your competition. Facebook fans 641. Twitter followers 14,427. About Blog The latest news and trends in mobile app testing and app development. Stay updated with the Ubertesters Blog. Facebook fans 1,861. Twitter followers 408. USA About Blog Find out the latest news and updates related to test automation industry that are trending on Blog of TestingWhiz - an automated testing tool. Automate testing of software, web & mobile apps with an easy & intuitive codeless end-to-end test automation tool. Facebook fans 805. Twitter followers 2,223. Chennai, India About Blog Indium Software is an outsourced Independent software testing company Est.1999 providing testing services across the globe. They have strong testing expertise in Cloud, Mobile, ERP, Social Game and offer offshore testing services for all major domains. Facebook fans 1,522. Twitter followers 191. ?stanbul, Türkiye About Blog SW Test Academy is focused on technical testing topics such as test automation, continuous integration, performance, mobile, web service, and API testing. Facebook fans 54. Twitter followers 90. India About Blog Testing Diaries is a prominent source covering tutorials, articles and productivity tips to carry out effective software testing. Facebook fans 1,326. Twitter followers 81. Noida, India About Blog 360logica endeavors to provide the best possible and highest quality of QA consulting and independent software testing services at cost-effective price. Leader in Software Product Testing Independent Testing Services, Manual testing, Functional Automation, Performance test engineering, Stress testing. Facebook fans 3,038. Twitter followers 2,723. Silicon Valley About Blog This software testing blog and knowledge center provides resources to help anyone improve or learn more about software testing. Facebook fans 868. Twitter followers 6,006. London About Blog The latest industry news from the software testing and QA community. TEST Magazine is a bi-monthly publication that looks at the processes, technologies, strategies, and opinions surrounding the software testing arena. Facebook fans 184. Twitter followers 6,749. UK About Blog Alan Richardson is an Independent Test Consultant & Trainer in Selenium WebDriver, Exploratory Testing, Technical Testing. Facebook fans 12. Twitter followers 3,646. Facebook fans 655. Twitter followers 341. Chennai, India About Blog Learn more about latest software automation testing tools and advanced techniques on the Codoid Blog. Codoid has provided software automation testing services across multiple domains & industries, serving 60 customers. Facebook fans 480. Twitter followers 23. About Blog Looking for the perfect software testing companies blog for regular updates about software testing needs, then get in touch with a dedicated qa partner - QASource blog. Facebook fans 434. Twitter followers 90. About Blog Latest Software Testing News provides you to know about today's Software Testing Industry. Facebook fans 3,485. Twitter followers 290. Sydney, New South Wales About Blog Welcome to KiwiQA Podcast, delivering fundamentals of software testing to help you build your knowledge and navigate the world of software testing.Let’s talk Software Quality & Testing. Facebook fans 445. Twitter followers 1,858. 49. Kualitee - Discussing New Bugs In Software Or Apps. US , UAE, Australia , Pakistan About Blog Kualitee is best software testing tool. Providing the top level features like test management, bug management, test case management etc. Facebook fans 394. Twitter followers 154. Falls Church, VA About Blog Astegic is a US-based Quality Assurance (QA) company with its offshore global delivery center in India. Astegic has a dedicated Testing Center of Excellence (TCoE), specializing in providing solutions across Mobile, Cloud, API and Big Data testing. Facebook fans 116. Twitter followers 36. Bluebird Pastures, Parker, CO About Blog Lisa Crispin is a tester who enjoys sharing her experiences and learning from others.In 2012, she was voted by her peers as the Most Influential Agile Testing Professional Person, and given this award at Agile Testing Days.This blog of her provides practical agile testing guidance and contains in depth information on agile testing. Facebook fans n/a. Twitter followers 14,889. Facebook fans 36. Twitter followers 1,498. Novato, CA About Blog Discover the Latest News & Information on Software Quality Assurance (SQA), Mobile Application Testing & More at Beta Breakers Software QA Labs. Facebook fans 3,175. Twitter followers 3. Sydney, New South Wales About Blog Here you can keep up and get helpful information on all latest updates of Digital Assurance & Automation Services. Facebook fans 436. Twitter followers 1,846. San Francisco Bay Area About Blog This blog is a repository and a reference to blog posts, initiatives, projects, conferences and any number of other things that would be of interest to the broader software testing community. Facebook fans 240. Twitter followers 4,827. About Blog Software Testing Tools is here to help you with any question you may have about testing. You'll find articles about testing methods, tools, news and more. Facebook fans 939. Twitter followers 204. New York, USA About Blog CloudQA offers Web Automation Tools and automated web application monitoring solution. It is a QA automation tool better than other application testing tool. Facebook fans 437. Twitter followers 279. Bulgaria About Blog Hello and welcome to my blog. My name is Viktor Slavchev and I am a software tester, but not the one that most people think they are – I don’t verify or validate, but I explore, I investigate, I experiment, I question. In other words, I take software testing very damn seriously. Facebook fans 249. Twitter followers 696. About Blog BETICA is a leading technology solutions provider specialising in Software Quality Assurance, Software Quality Assurance, Regulatory Compliance services and Software Development. Facebook fans 368. Twitter followers 19. New York About Blog Enterprise software testing technology advice through the experience of a Quality Assurance Professional. Wroclaw, Poland About Blog To tell somebody that he is wrong is called criticism. To do so officially is called testing. Facebook fans n/a. Twitter followers 368. Spain About Blog School of automation testing. About Blog At Possum Labs every solution is unique and crafted to meet the specific needs of each company’s particular structure, culture, and goals. Why Possum Labs? Playing Possum works, because it is an unanticipated solution and no one else does it. Melbourne, Victoria About Blog We complement your #softwaretesting activities to create a paradigm shift in your delivery standards. Ahmadabad City, India About Blog The Best Software Testing Solutions partner and get a bug free and high performance rated Software's, Web & Mobile Apps. Facebook fans 827. Twitter followers 27. UK About Blog We are the leaders in automated testing training because that is all we do! Edgewords: The Training Specialists for Automated Software Testing With over a decade of delivering training to Software Testers , Edgewords is the trusted training company for the Software Testing industry. Edgewords is the exclusive training partner for Ranorex in the UK. St. Louis, MO About Blog Hi! I'm Michael Fritzius, and I'm a software tester who loves sharing what I know about the testing world, as much as I do finding bugs and automating tests. Friends and colleagues call me Fritz. You can too. This blog is a lot of fun to write, and I sincerely hope you find something useful here. About Blog This is a discussion forum for software testing and quality assurance professionals - Software Testing and Quality Assurance Online Forums for software testing tools and topics. Facebook fans 96. Twitter followers n/a. About Blog Learn all about Software Testing, Software Testing Videos, Agile, and DevOps at www.qarevolution.com. They are changing how software testing is done. Facebook fans 137. Twitter followers 236. Bangalore and Delaware About Blog Moolya is a trusted software testing partner to several industry leaders and cutting edge startup companies in India and abroad. Facebook fans 4,936. Twitter followers 2,525. Mysore About Blog This blog shares daily learning tutorials on software testing. Facebook fans 27. Twitter followers 1,183. San Mateo, CA 94404 About Blog Applitools has developed the first cloud based software testing tool that automatically validates all the visual aspects of any Web, Mobile and Native app like a manual tester does. Facebook fans 320. Twitter followers 1,719. San Francisco & Berlin About Blog QA, testing, product development, and all the things that can possibly go wrong with them in one convenient blog. Facebook fans 893. Twitter followers 479. Foster City, CA About Blog LogiGear provides leading-edge software testing technologies and expertise that enable customers to accelerate business growth. Thought leaders in software testing and test automation, based in Silicon Valley and Vietnam. Makers of the TestArchitect test automation framework. Facebook fans 50. Twitter followers 627. About Blog SP Sankar is a testing consultant and a testing partner. Follow this blog where he shares his knowledge on testing. About Blog Dedicated to thoughts about software testing, QA, and other software quality related practices. He will also address software requirements, tools, standards, processes, and other essential aspects of the software quality equation. Facebook fans 672. Twitter followers n/a. New York, US About Blog QA Mentor is independent software testing company and top provider of 37 different Quality Assurance testing types, with 24 different services. Facebook fans 17,349. Twitter followers 6,456. Atlanta, GA About Blog Follow this blog to read topics about test case management for software development across platforms like Jira and methodologies like BDD and TDD. Facebook fans 1,176. Twitter followers 11,068. About Blog ISTQB Dumps is a training course and study guide for aspiring and current Software Testing professionals studying to become a certified tester. Their course material is packed is for the ISTQB Certification in Software Testing at foundation level and covers topics from Static Testing to Test Management to Acceptance Testing etc. Facebook fans 6,674. Twitter followers n/a. Berlin, Germany About Blog TestObject tests your iOS and Android app on hundreds of real devices. Manual and automated app testing made easy. Learn more about mobile app testing with TestObject. Facebook fans 1,305. Twitter followers 1,284. Bangalore, India About Blog 99tests is a crowdsourced testing platform which helps companies to test their software products by top notch testing professionals. Facebook fans 5,219. Twitter followers 1,675. World About Blog A professional association dedicated to improving the practice of software testing by advancing the science of testing and its application. Facebook fans 1,184. Twitter followers 3,250. 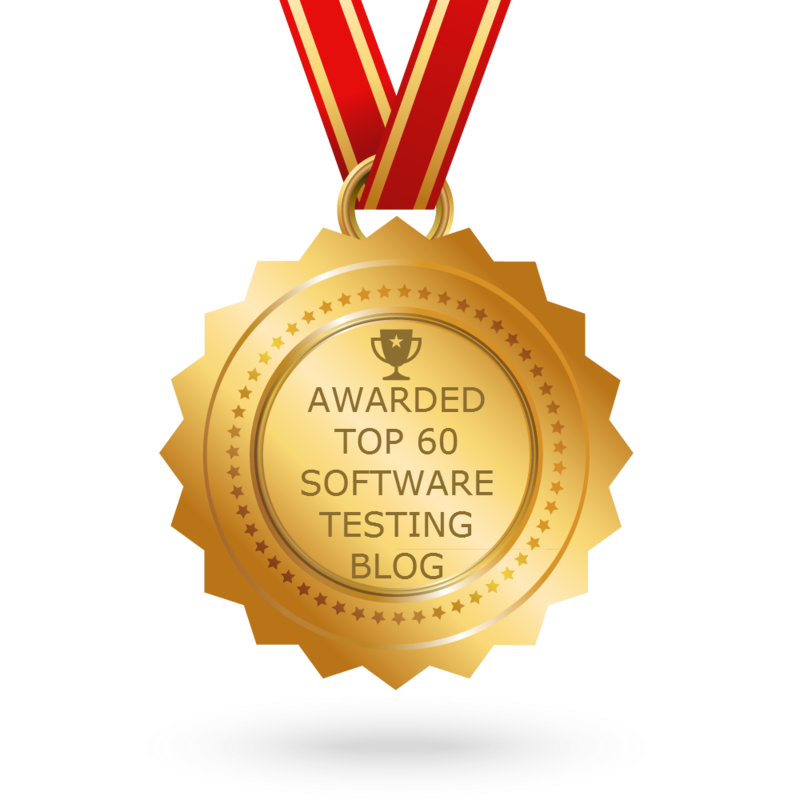 CONGRATULATIONS to every blogger that has made this Top Software Testing blogs list! This is the most comprehensive list of best Software Testing blogs on the internet and I’m honoured to have you as part of this! I personally give you a high-five and want to thank you for your contribution to this world.